MARIUPOL, Ukraine—The world is finally paying attention to Galina Odnorog. On behalf of the port of Mariupol, the 50-year-old Ukrainian volunteer activist has been coordinating a media outreach campaign since August 2017, trying to alert Western countries to the threat posed by Russia to Ukraine-bound shipping traffic in the Sea of Azov. “Russia has blockaded our Sea of Azov ports. It’s an act of economic warfare, and we want the world to pay attention,” Odnorog said during an interview in Mariupol, a Ukrainian port city of half a million people on the Sea of Azov, which is within earshot of the ongoing land war in eastern Ukraine. For more than a year, Odnorog’s information campaign largely fell on deaf ears—particularly among Western media outlets. That changed on Nov. 25 when Russian forces seized three Ukrainian naval ships near the Kerch Strait and took 24 Ukrainian sailors prisoner. The high-stakes naval confrontation—in which Russian forces fired on the Ukrainian vessels—spurred Ukraine to put its military on full alert and declare martial law in 10 border territories deemed most vulnerable to a Russian invasion. Suddenly, the world’s media spotlight was on Ukraine, and Russia’s ongoing harassment of Ukrainian ships in the Sea of Azov was front-page news. Overnight, Odnorog was in high demand, fielding one interview after another with foreign journalists. On this night, Odnorog is at a hip café in central Mariupol called “Bread du Soleil.” She walks in a bit flustered but is effusively polite and immediately talkative. She sits leaning forward with her hands folded on the tabletop before her. Her fingers fidget as she talks, not nervously, but with a pent-up energy, like she’s racing against the clock to say everything she wants to say. Above her, origami snowflakes dangle from the ceiling—it’s Christmas season, after all, even on the edge of a war zone. Odnorog exudes a wide-eyed air of disbelief at all the attention she’s received from foreign journalists (this correspondent included) during the preceding week. But she’s been working toward this moment for more than a year. Finally, she has the world’s attention. And she’s not going to let the opportunity go to waste. Thus, this past week has been a redemption of sorts for Odnorog, who has been volunteering to help fight Russian propaganda since the war in Ukraine began in the spring of 2014. Still, the recent naval confrontation was also a sober reminder that the 4.5-year-old war—in which more than 10,300 Ukrainians have died—is likely far from over. In May 2018, Russia completed a bridge over the Kerch Strait, establishing a land connection between mainland Russia and Crimea, a peninsular territory Russia invaded and seized from Ukraine in early 2014. Since the bridge’s completion, Russian naval forces stepped up harassment of Ukrainian merchant vessels at the Kerch Strait and in the Sea of Azov, a key trade route for Ukraine. Back in August 2017, officials at Mariupol’s commercial port had already recognized the Russian project as a threat to Mariupol’s economy. Yet, the Ukrainian government in Kyiv remained largely mute on the subject. So, port officials enlisted Odnorog to help sound an alarm, which they hoped would attract Western media attention. Aleksandr Oleynik, the director of Mariupol’s commercial sea port. “I’m a public figure, I’m a representative of the government. So it’s good to combine my efforts with those of civil society,” Aleksandr Oleynik, the director of Mariupol’s commercial sea port, told The Daily Signal during an interview at his seaside office. 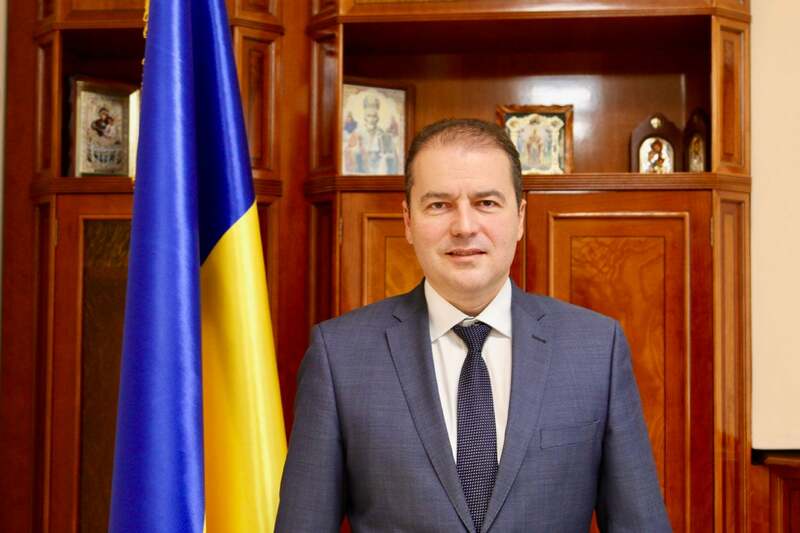 Oleynik praised Odnorog’s work, underscoring its value to countering Russian disinformation regarding the ongoing confrontation in the Sea of Azov. “It’s essential to give an objective perception of what’s happening here,” Oleynik said. Specifically, Odnorog and Oleynik both argue that Ukrainian vessels have the absolute right of free passage through the Kerch Strait, according to a 2003 maritime treaty between Russia and Ukraine. For her part, Odnorog is a volunteer activist and not paid for her work. She says, however, that she is motivated by a “love for Ukraine” to manage—pro bono—the kind of media blitz that Ukraine’s government should have launched on its own volition years ago. Following its 2014 takeover of Crimea, Russia organized a proxy war in eastern Ukraine and eventually sent thousands of its regular troops into Ukraine’s embattled eastern Donbas region. Today, the war in the Donbas is ongoing along a 250-mile-long, entrenched front line. 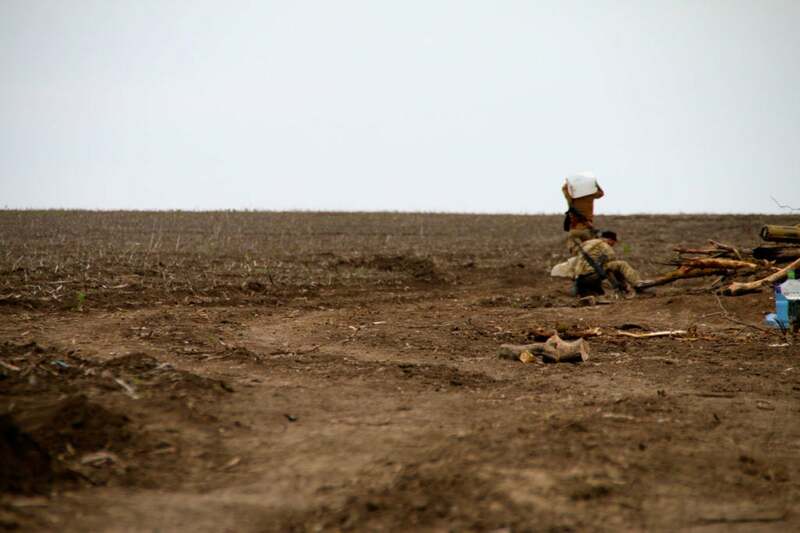 More than 10,300 Ukrainians have so far died in what remains Europe’s only ongoing land war. The Nov. 25 naval confrontation effectively shattered the military stalemate that has held the land war at bay since a shaky, February 2015 cease-fire, known as Minsk II, went into effect. Ukrainian officials warn the maritime crisis could signal a major escalation of the ongoing military conflict. “First, Russia annexed Crimea. Now, Russia wants the whole Sea of Azov,” said Oleynik, the director of Mariupol’s commercial sea port. Mariupol is within one of those 10 Ukrainian regions currently under martial law. But you’d hardly know it. There are troops on the platform at the train station and occasionally on the streets—but it’s always been like that in Mariupol since the war began. Life goes on, as it has in Mariupol for the past 4.5 years, despite the ongoing shelling of the trench war only about 10 miles east of the city’s limits. “It’s been a crazy four and a half years,” Odnorog said of living within earshot of the war since the spring of 2014. 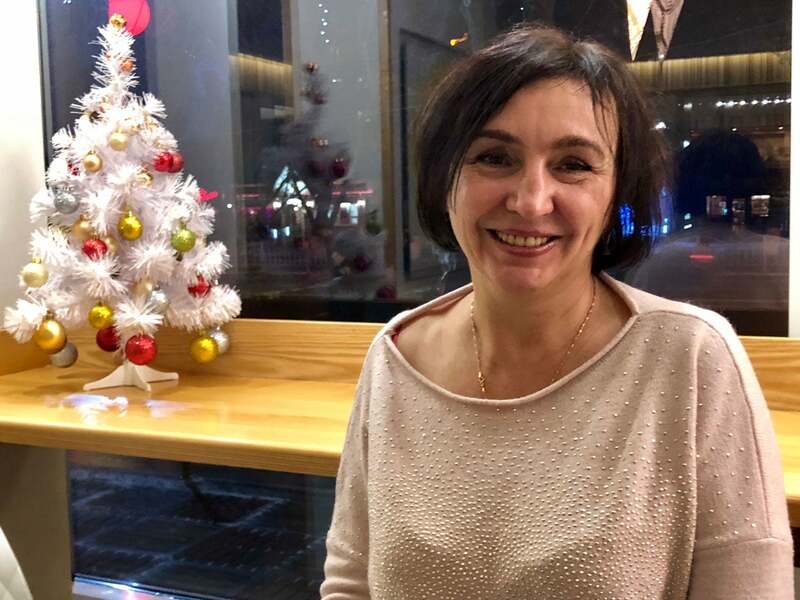 Ukrainian volunteer activist Galina Odnorog, 50, has worked to alert Western countries to the threat posed by Russia to Ukraine-bound shipping traffic in the Sea of Azov. At the war’s outset, Odnorog’s activism focused on educating the Russian people about the covert war their leaders were waging in Ukraine. In particular, Odnorog said she appealed to the mothers of Russian soldiers. Her efforts never resonated, however. Thus, as the war matured, Odnorog changed her messaging strategy. On Tuesday, Ukrainian officials announced that Russia had “partially” unblocked Ukrainian ports on the Sea of Azov, allowing Ukrainian ships to pass through the Kerch Strait for the first time since the Nov. 25 naval confrontation. As of Tuesday, about 170 ships were waiting to pass the Kerch Strait, down from 400 one week earlier, said Petro Tsyhykal, head of Ukraine’s Border Guard Service, according to Ukrainian agencies. “The silent economic blockade still takes place. The regime has almost not changed, it is complicated,” Tsyhykal reportedly said. For his part, Oleynik, the director of the Mariupol’s commercial port, downplayed the development, claiming Russia has already created a permanent shipping chokepoint through the Kerch Strait into the Sea of Azov. The move signals a long-term, de facto blockade, Oleynik claimed. “It’s a very major restriction that Russia has introduced. It’s economic warfare,” Oleynik said. 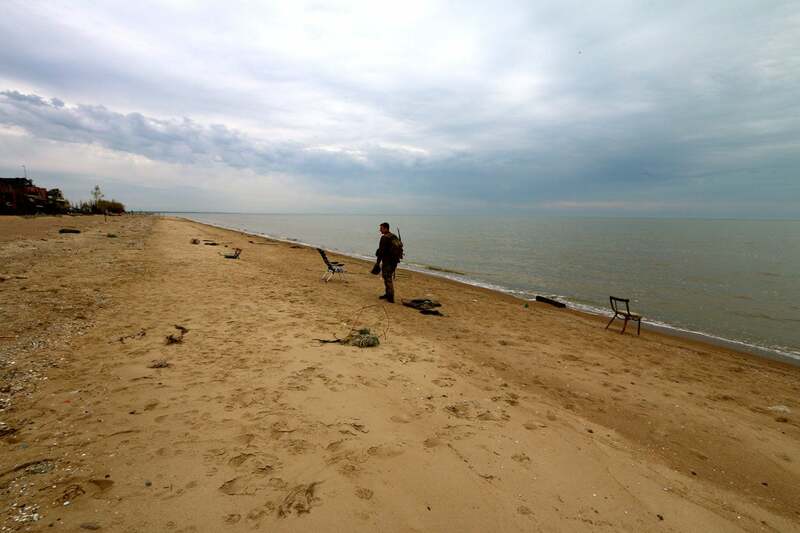 “Mariupol has suffered the most in this conflict,” he added. Oleynik has held his post for five years—spanning the entire duration of the war. He’s been working at the port since he graduated university in 1992. 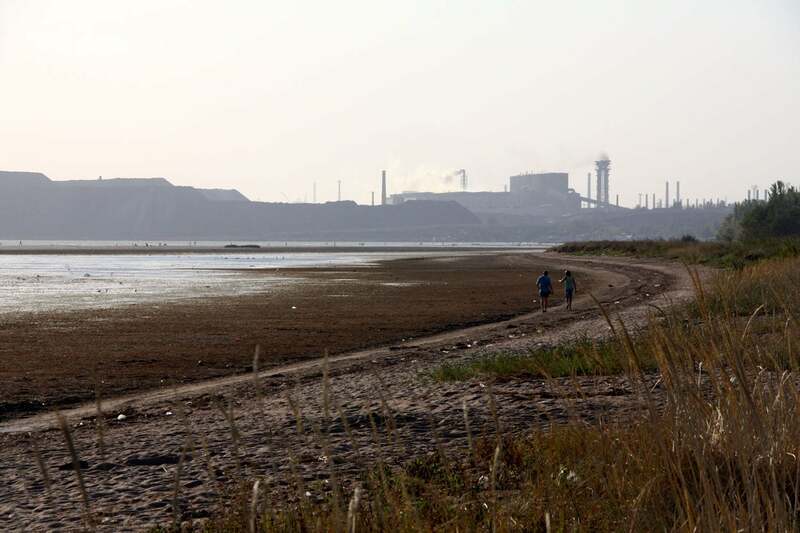 Mariupol’s industrial Sea of Azov coastline. During an early morning meeting, the port director is polished in both appearance and language. His workspace is organized, immaculately clean, and simply appointed. 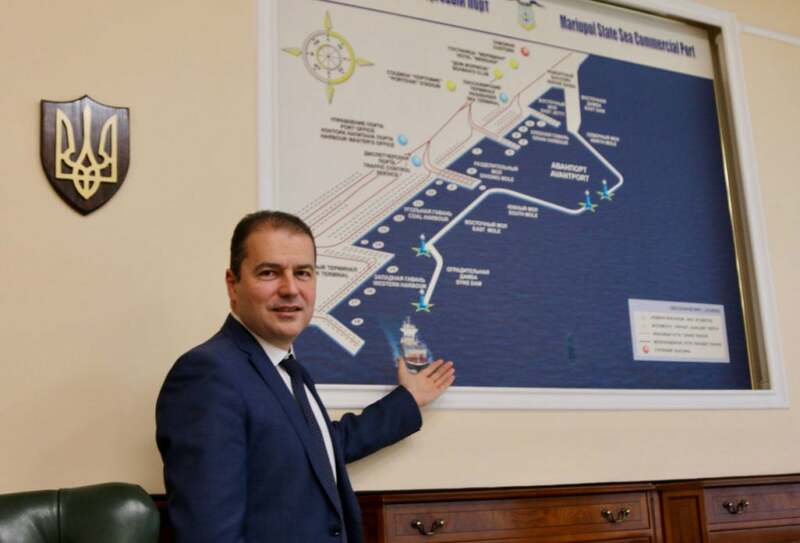 He launches into the interview prepared with a litany of facts and figures on hand; at one point he sketches on printer paper to detail how the Kerch Strait bridge restricts the drafts and tonnage of ships bound for Ukrainian harbors. The Kerch Strait bridge, from its conception, was always designed to impose a blockade on Ukraine’s Sea of Azov ports, Oleynik said. First of all, the bridge was built too low. Prior to the bridge’s completion, Mariupol’s port received ships with air drafts (the height of a ship above water) of up to 41 meters (about 135 feet). Now, in order to fit under the Kerch Strait bridge, the air drafts of ships bound for Ukraine’s Sea of Azov harbors are limited to no more than 33 meters, or about 108 feet. Moreover, Russian authorities at the Kerch Strait passage have imposed a 22,000-ton limit on the cargo loads of passing ships—that’s a lot less than the 32,000 tons of cargo ships calling at the Mariupol port routinely loaded per trip. Russia’s new restrictions at the Kerch Strait mean shipping companies doing business at Ukraine’s Sea of Azov ports now have to send smaller ships, and then load those ships with less cargo. That’s inherently bad for shipping companies’ bottom lines, Oleynik said. The Mariupol port is only a short drive from the front lines of the ongoing land war. But Oleynik said the Ukrainian military has been defending the facility for a long time prior to last week’s institution of martial law, and he considers the threat of Russian sabotage against the port to be low. Russia has ports on the Sea of Azov, too, but its harbors are shallower than Ukraine’s. By necessity, ships bound for Russian ports on the Sea of Azov are smaller and have shallower drafts than those bound for Ukrainian ports. The Russian ships that pass through the Kerch Strait typically only carry cargoes of about 3,000 to 5,000 tons, versus the more than 20,000 tons of cargo typically loaded onto ships at Ukrainian ports, Oleynik said, citing industry data. Mariupol is the deepest harbor on the Sea of Azov, permitting much larger ships than at Russia’s ports. Thus, the size and tonnage restrictions that Russia is now enforcing on ships passing through the Kerch Strait are exclusively harmful to Ukrainian ports on the Sea of Azov—and Mariupol in particular. A central, dredged channel (dug 8 meters deep and 150 meters wide) runs through the Kerch Strait. Prior to the Kerch Strait bridge, there was enough room for large ships bound for Ukrainian ports to use the dredged channel while smaller Russian cargo ships could safely use the shallower waters on either side—effectively allowing traffic of multiple ships abreast through the Kerch Strait. 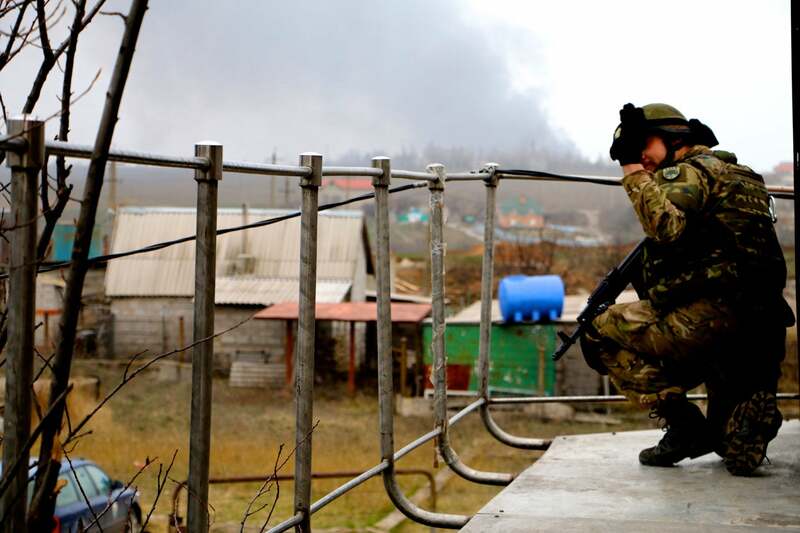 The front lines of the war in Ukraine are within earshot of Mariupol. Now, the Kerch Strait bridge’s pilings are too close together for any cargo vessels to enter the strait other than by passing under the bridge’s main span. Since the dredged channel passes under the main span, too, access to the strait is now limited to one ship at a time, thereby creating a bottleneck that did not exist prior to the bridge’s construction. Compounding the delays, Russian authorities mandate that each ship passing through the Kerch Strait submit to a Russian inspection and take aboard a Russian pilot. The inspections typically last one to one and a half hours. But ships bound for Ukrainian ports report waiting in line from two to 15 days to receive those inspections—costing shipping companies about $15,000 a day to simply sit idle. That delay lasts five days or more on the return journey to exit the Sea of Azov to the Black Sea, Ukrainian officials say. Amid the queuing ships at either end of the Kerch Strait, Russian ships are unfairly given priority, Ukrainian officials say. Mariupol used to be known colloquially as the “Sea Gates of the Donbas”—most of the exports from Ukraine’s industrial Donbas region flowed to world markets through the city’s commercial port. In 2007, about 17.5 million tons of cargo passed through the Mariupol port annually. That number dropped to about 14.5 million tons of cargo per year from 2008 to 2014 due to the global economic crisis. Then, in 2014, the Donbas was essentially cleaved from Ukraine by Moscow’s hybrid warfare campaign, staunching the flow of exports from the Donbas through Mariupol’s port. In 2015, after the first year of the war, the annual cargo tonnage through Mariupol’s port dropped to about 8 million tons per year—representing roughly a 45 percent drop in one year. That number dropped even further to 6.5 million tons of cargo annually in 2017 when Russia began its harassment of Ukrainian ships in the Sea of Azov. And in 2018, following the completion of the Kerch Strait bridge and the implementation of Russia’s restrictive inspection policies, Mariupol’s annual cargo tonnage dropped again—down to 5.3 million tons of cargo annually. That number represents only 30 percent of the amount of cargo passing through Mariupol in 2007. Russia’s shipping restrictions at the Kerch Strait are tantamount to a blockade, says Aleksandr Oleynik, the director of Mariupol’s commercial sea port. Still, Mariupol’s massive Ilyich Iron and Steel Works and the Azovstal Iron and Steel Works plants export the overwhelming majority of their goods through Mariupol’s port. Those two facilities are the linchpins of Mariupol’s economy—and important economic assets to Ukraine as a whole. Oleynik says the combined effects of the war and Russia’s blockade have cost Mariupol about 200 million euros ($227 million) since 2014. And in 2018, the Mariupol port lost $10 million in revenue due to Russia’s maritime interference, Oleynik added. The Mariupol port has also lost several key shipping contracts due to Russia’s blockade. 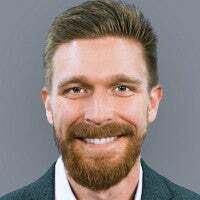 A contract to ship pig iron to the U.S. has been canceled, as were multiple contracts to Asian countries, totaling about 500,000 tons of cargo annually. The average cost to ship goods from the Mariupol port has gone up by about a third, and the travel time has been increased, too. A round trip from the Italian port of Genoa to Mariupol took roughly 15 days prior to the Kerch Strait bridge’s completion in May. Now, the journey takes more than a month, Oleynik said. 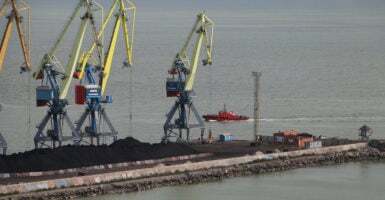 Despite the economic headwinds, Oleynik says the number of workers at the Mariupol port has only dropped by about 200 since the war began—from 3,500 in 2014 to 3,300 today. Yet, he admits there’s a limit to how much lost revenue can be compensated through increased efficiency. At some point, if the war goes on long enough, personnel cuts will have to be made. Other Ukrainian ports on the Black Sea offer an alternative to Mariupol. Goods just have to be shipped farther by rail to reach their port of departure. So, the overall economic impact of Russia’s strangulation of the Sea of Azov is likely to be more acutely damaging to Mariupol’s local economy than it is to Ukraine as a whole. For that reason, Oleynik calls Russia’s actions at the Kerch Strait a blockade designed to specifically destabilize the economic situation in Mariupol. He says it’s all part of a larger Russian gambit to consolidate control over the entire Sea of Azov basin. Oleynik does not foresee a military solution to the current crisis. He says the only path forward is for the international community to leverage pressure on Russia to abandon both its inspections at the Kerch Strait and the harassment of ships bound for Ukrainian ports within the Sea of Azov. A battle outside of Mariupol near the town of Shyrokyne in 2015. As the 4.5-year-old land war now takes to the sea, Odnorog, for her part, said NATO involvement is key to changing Russia’s policies at the Kerch Strait. Ukraine is not a member of NATO. When asked why NATO should commit its military resources to defend Ukraine’s right of free passage into the Sea of Azov—a body of water on which only Russia and Ukraine have shorelines—Odnorog framed the conflict as part of Russia’s larger assault on international institutions and norms.